Traverse City Restaurants: When I think about the best changes in American culture during my lifetime, the proliferation of the new American café is right there in the Top 10. Sure, the great coffee and aromas are part of it, but just as important, they are places where community happens, where people meet, chat, chill. They’ve helped save the American city. And among my favorite café entrepreneurs are the folks behind Morsels, at the east end of Traverse City’s Front Street and Cavallino’s, a brand new cafe in the Traverse City’s Hagerty Center. 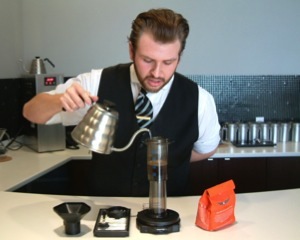 Owner Misha Neidorfler told me that one of her baristas, Spencer McQueen, is heading down to Detroit this weekend to compete in a barista competition—using an AeroPress coffee system to brew a perfect cup of Joe. I stopped in to chat with McQueen before the big event, check out the quick QA in this blog post. Check out the best cafés of Northern Michigan in our Restaurant Guide!